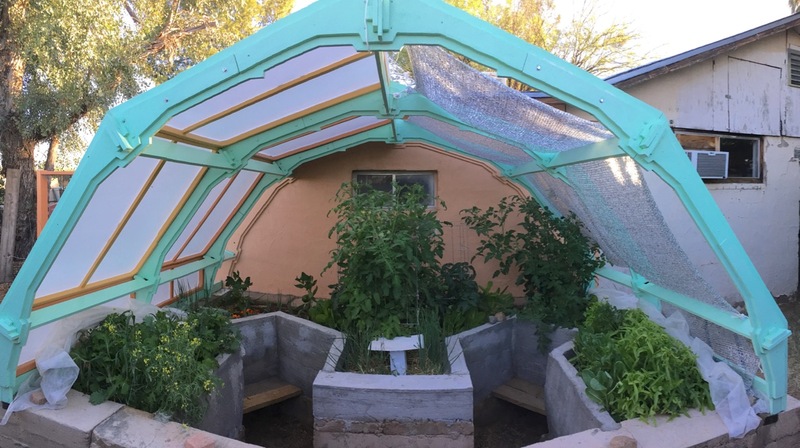 There are times in my life a citizen scientist when I wonder if the prototype arch is robust enough to meet the challenge I set for it: making it possible to grow healthy vegetables through extreme conditions, working with the forces of evaporation and transpiration. My philosophy is hopeful, akin to that of a practitioner of Aikido, expressing gratitude for the universe, our ancestors, fellow human beings, and the realm of nature. I sought out martial arts that stressed unarmed grappling techniques: Jujutsu first, and its derivative Aikido later. This was a response to my labored breathing, a consequence of my young life lived in fear of my father, and of bullies I encountered at school. The word Jujutsu can be broken down into two parts. “Ju” is a concept. The idea behind this meaning of Ju is “to be gentle”, “to give way”, “to yield”, “to blend”, “to move out of harm’s way”. “Jutsu” is the principle or “the action” part of Ju-Jutsu. In Japanese this word means science or art. The science and art of gardening in extreme heat and dry conditions involves grappling with the ways in which plants breath and lose moisture. Rather than use fossil fuel power to create cool conditions, instead I look to use the natural exhalation of the plants to cool themselves. This is done by containing the rate of evaporation, and keeping the evaporative process close to the bodies of the plants. This has evolved into a layered approach that holds water close in the soil, holds the evaporation and transpiration of the water close to the ground, and employs shade cloth and row covers to hold temperatures down to or below 86˚ F. – that point where plants experience stress as the loss of water through transpiration exceeds the water available from the soil. These elements of heat, water, soil and breath (air) are blended with the gentle restrictions of the arch structure, just as the canopy of a tree provides similar conditions. The results I hoped for would be tested by the Summer of 2017 in Tucson, Arizona: a time of record setting heat. Early on in my first prototype Nurse Tree Arch I used an Arduino controlled set of ground and air sensors taking both temperature and humidity readings. Today in the Earth Arch I use calibrated SensorPush cubes placed in sensor shields of my making, sometimes at just above ground level (and below understory canopy) and other Meade sensors at five feet in shaded patios near my arch structures. These are cross-referenced to National Weather Service temperature and humidity reported at Tucson’s Airport. I use a hand-held laser infrared thermometer for gathering surface soil temperatures. In January, 2017 I completed the arch frame on the Earth Arch. I completed four Solexx panels for the west face of the arch, and in April I added a 50% weave of Aluminet shade cloth on the east face. Keep in mind that the Earth Arch extends out 8 feet from the south facing wall of a 1930’s era concrete block ranch garage and storage building. This face of the building receives direct sun for 8-9 hours a day. Outside temperatures recorded by the SensorPush instruments are higher than airport temps as a result. On April 26th, 2017, with temperatures expected to reach 100˚ within a week, I ran an experiment using hydrophobic row cloth as a cover for a bed of Parris Island Cos lettuce, Oak Leaf Loose leaf lettuce, and Arugula. 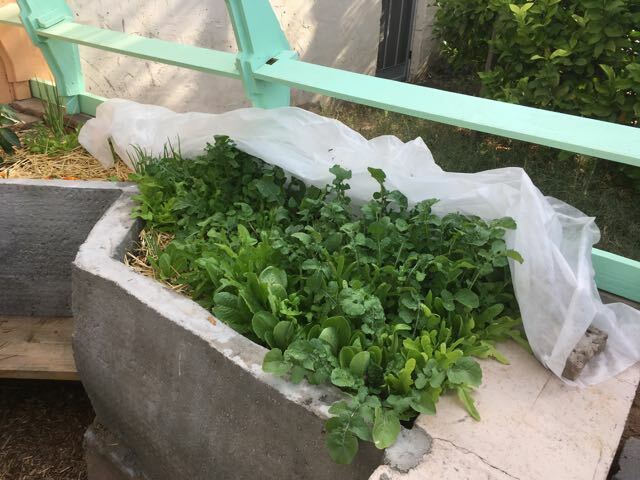 I was very pleased with the production of lettuce, given that desert adapted varieties of lettuce are typically stressed and bolting at this point in the season. On June 6th at 4 pm, SensorPush and Meade instruments measured air temperatures just above ground level under the row cover, outside the row cover but still inside the cover of Solexx and Aluminet, and outside the arch. I was surprised how much difference I got with the several layers of cover. That is a difference of 16˚ where it matters most – on and near the ground where the roots and plant leaves are. I am able to measure 5-8 degree differences in temperature attributable to the 50%-75% Aluminet. This suggests that the 16˚ difference is at least half a contribution of plant and soil evaporation cooling both mediums. In addition we know that removal of Biomass (the leaves and stems of living plants) raises temperatures due to both loss of shade and transpiration-based cooling in these hybrid green to screen houses (see blog report on June 28, 2013 spider-mite infestation that removed cucumber from south face of Prototype #1 – resulting in a 6˚-8˚ rise in ground temperatures the next day). On June 14th, 2017 I placed an additional layer of 75% weave Aluminet over the entire arch. This was in preparation for advertised temperatures of 105˚ to 116˚ F. for the week to come. The month of June, 2017 was the hottest June on record. The average high of 105.3˚ was 5˚ above normal. The average temperature of 89.5 set the all-time record. Six days were 110˚ or higher, tied for 4th most in year. The 116˚ recorded on June 20th tied for 2nd hottest day ever, just one degree below the all time record of 117˚. On June 20th, that 116˚ record for the day, The SensorPush and Meade instruments recorded air temperature and humidity levels inside and outside the Earth Arch at 3 pm. I lack any instrumented data on soil moisture. What I do know is that I apply 15 gallons of water to the 40 square feet of soil in beds that are 24 inches deep over a 12 inch deep bed of cottonwood and other dead woods some harvested on site. These beds have non permeable earthcrete and ferroconcrete walls with loamy sand soil at the base. They create a heat bank, slow to heat during the day, and radiating heat at night. The beds are always moist at 6 inches and often at the surface at well. Tomatoes are deep rooting broad leafed plants that sweat profusely. I’ve chosen both hybrid (Early Girl and Summerset) and heirlooom varieties (Punta Banda, Nichols). The deep composted soil, along with a soil temperature that is maintained in the mid-80˚s, have encouraged rapid growth of biomass. The cover created by Solexx, which scatters the intense radiation of the afternoon sun is complemented by Aluminet, which reflects heat away from the beds. 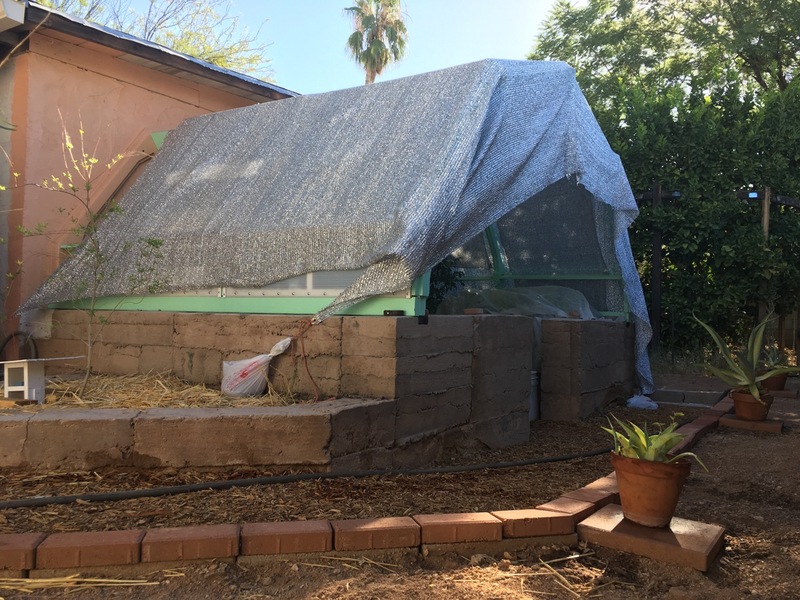 This protects the beneficial effects of the plant canopy and transpiration, which create an evaporative cooling environment, and the open weave of the covering allows breathing and discourages fungal and other wet-environment problems, while also reducing evaporation away from the beds.